Simply stated, older people’s qualities and their affinity for purpose and engagement position them to make critical contributions to the lives of youth….At the same time, such engagement fulfills older people’s desire for a sense of meaning and purpose, which in turn promotes well-being. Mutually meaningful relationships develop for both old and young. In his bestselling book, Being Mortal, author Dr. Atul Gawande tells the story of a senior community in Boston called NewBridge that shared grounds with a K-8 school. At NewBridge, the seniors could work in the school library and tutor students, while the students would report to the senior housing to get first-hand accounts of World War II for their history classes or to put on programs and performances. Senior residents became so close with their school-aged neighbors that one child was even asked to speak at his senior buddy’s memorial service. Currently, the keiki at KCS have been collaborating with our seniors on a cookbook filled with the elders’ favorite recipes, helping to foster dialogue between the two groups about something everybody loves–food! We are so honored and grateful to have Gordon and Sandy Young as regular volunteers at Manoa Senior Care. Each month this dynamic duo visits our Kaimuki homes to sing and play ukulele for our seniors. 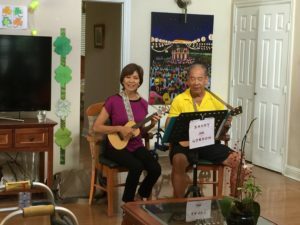 Recently they appeared in Hawaii News Now’s Kupuna Achievers feature, which highlighted their volunteer work at several care homes around Honolulu. When they first got in touch with us to volunteer several years ago, they told us that their main motivation was to give back to the community and to practice their new instrument. In the intervening years, it has been our pleasure to see their skills and musical confidence grow, all while building excellent rapport with our seniors. Mahalo nui loa, Gordon and Sandy! Click here to see their story from HNN. This year, Manoa Senior Care is honored and delighted to begin a partnership with Kaimuki Christian School. The youngsters will be visiting throughout the school year. We believe their youthful exuberance and our elders’ wisdom and gratitude will come together to enrich everyone involved. Recently, KITV did a short feature about it.